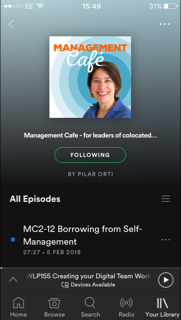 In this episode, Pilar and Lisette talk about the process of onboarding new members onto virtual teams. 02:20 What happens when not everyone speaks English? We talk a bit about his on Lisette's return from the Happy Melly Learning 3.0 camp. When language is a barrier to communication. 11:40 We talk about this article http://www.bloomberg.com/news/articles/2015-05-21/slacking-off-can-office-chartrooms-makes-us-more-productive-time-wasters-? and about how the intranet reflects the culture of the company. 16:40 Introduction to the use of tools should form part of the onboarding process. 18:35 Who's role is it to look after the onboarding process? 19:25 Setting expectations, it starts with recruitment. We mention this other podcast on recruiting for virtual teams. 22:40 Create a team agreement: how are you going to communicate and share information? Does anyone need training on some of the communication tools. 29:45 Jeremy Stanton "You've got to fail people as fast as possible." Giving extensive feedback at the beginning of the process. 38:30 Creating a sense of community. 40:00 Giving a personal welcome. 41:00 Personal maps. Pilar cringes at some of Lisette's suggestions for getting to know each other, but sometimes the simple, informal questions can get people who have problems with language engaged. Personal preferences vs what's good for the team. 51:44 Meet face to face. Teambuilding needs to be ongoing, but especially important at the beginning. 56:10 Learning about the company. Alignment around goals. Ongoing feedback helps with alignment. Keeping the onboarding plan alive and visible. Time invested in onboarding increases the potential of your team flying!